Reporting is an effective way to prove marketing’s value up the organizational chart. But many marketers don’t know what to report on and choose “vanity metrics,” which often sell our teams short. According to a survey conducted by the Fournaise Marketing Group, 69% of marketers feel their strategies and campaigns do make an impact on the company’s business, but they don’t know how to prove it. Iterative Marketing is seeking to establish marketing’s value in organizations by meeting and exceeding expectations through reporting. ROI: This is a top frustration of marketers because it is difficult to prove. Not every marketing activity can be attributed to a specific purchase or new client. When revenue can be directly attributed, it can often trail behind marketing 3-12 months. Through leading indicators (KPIs), marketers can indicate in advance what our trailing indicator (revenue) will be. KPIs can include leads, appointments booked, demos, free trials, etc. Read this blog to learn how to prove ROI with KPIs. Iterating and improving: Document and report on the improvements we make to marketing activities based on experiments and data. The goal is to show folks we are producing continual improvement through optimizations. Metrics should always be reported in context of their change over time to show improvement from the month prior. Insights: If our experiments are set up correctly, we are not just improving results, but also generating insights. Thoughtful experiments tell you about the personas you target and the journeys they follow along the buying process. Read Heather’s blog on generating insights from experiments for more information. Regular and consistent reporting proves marketing’s value to the c-suite and organization. 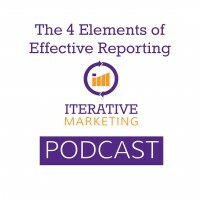 Learn more about how Iterative Marketing helps your reports accomplish what you need. This is the last podcast on Iterative Marketing’s six actionable components. Next week we will discuss how to start applying Iterative Marketing to your organization.